Home Ripple Toast Wallet Review 2019 – Best Ripple (XRP) Wallet? Availability of dedicated cryptocurrency wallets has been one area where XRP lagged significantly behind the rest of the “best” cryptocurrencies on the market. For example, this was one stick that was used quite often by holders of the Stellar Lumens cryptocurrency to beat “Ripplers” with, as XLM notably has a serious selection of wallets that were built to store it. Other cryptocurrencies like Bitcoin, Ethereum, Litecoin etc. all have their own dedicated wallets too. This deficiency was addressed with the introduction of a product called Toast Wallet. This wallet was created in 2017 by a company called StarStone Unlimited, Dunedin (NZ)-based enterprise founded by one called Richard Holland. StarStone corporation has been around since 2017 itself and the wallet seems to be their only business endeavor so far. The motto they went with while designing this product was to create something that is “simple enough for your grandma but safe enough for a Swiss banker”. Toast wallet can be downloaded from its official website, which shows you that its software was latest updated in October of 2018 to a version 2.3.12. See our list of other top XRP wallets. 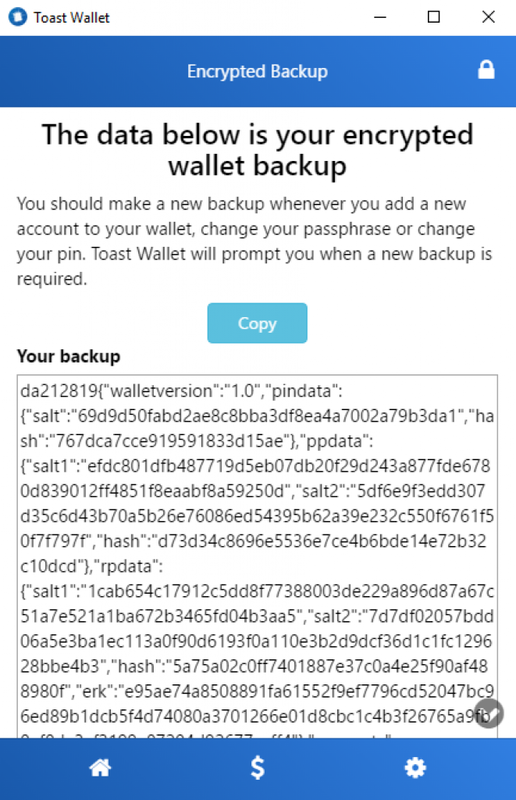 As long as you have this version installed, your Toast Wallet will be up to date. The wallet is open source and is available for multiple platforms, including PC/tablet (Windows, Linux, Mac OSX, browser) and mobile (Android, iOS). The team recommends that people with jailbroken iOS devices don’t use their wallet, as it’s highly likely that it won’t behave normally on pirated software. They also recommend that people update their legitimate software to at least iOS 11 for normal operation. Wallet’s phone binaries are built directly from the GitHub repository using Adobe Phonegap’s cloud build service, the output of which can be found at https://build.phonegap.com/apps/2733163/share. Its PC binaries are built from the browser version of Toast Wallet using electron-builder; the wallet creators show their transparency by openly inviting third party analysts to look into the code and inspect the binaries. You can download your version of choice from the official Toast Wallet website https://toastwallet.com. Toast wallet is free, as the company expects to earn money by providing unnamed XRP-related services; they clearly want to build their brand up with the wallet and then branch out onto other XRP-related things. Once you download and install the wallet, you will be given the choice between three options: creating a new wallet, restoring an existing XRP wallet, and submitting an offline transaction. For now, you can click on the “Create New Wallet” green button and start setting up your very own XRP wallet. created and filled with XRP. After entering your PIN, the wallet will ask you to enter a passphrase. 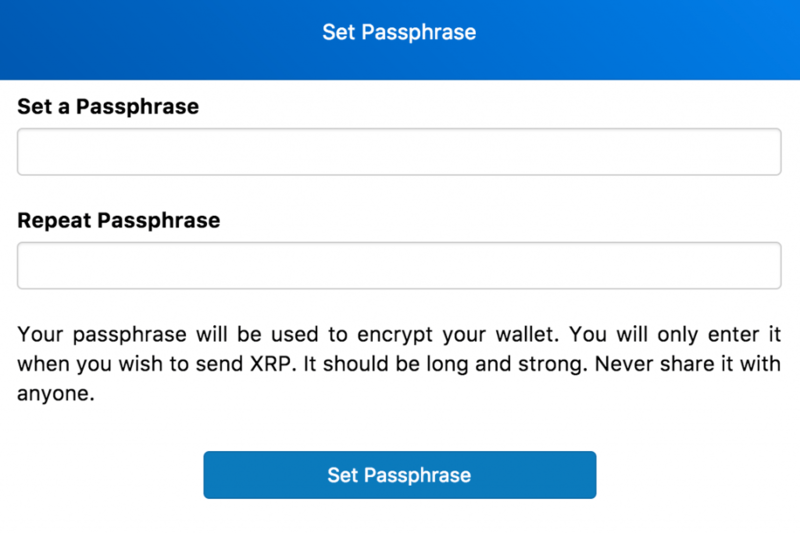 This passphrase will be used to encrypt your wallet, verify sending XRP from the wallet and to recover your Toast Wallet account in case you aren’t able to access it anymore for various reasons. report this adIt’s recommended that you print out both the PIN and the passphrase and store them somewhere safely, as you won’t be able to access your XRP if you forget these. The wallets protect the funds using a passphrase and a PIN code. This information is saved in PouchDB– an open source database, which enables you to store data offline and prevents Toast Wallet developers from accessing it. The wallet then generates a 6 word recovery phrase that can also be used to access your wallet in case you lose your passphrase. Both the passphrase and the recovery phrase require the user to create a backup of his/hers account. Making the backup should be done after entering all of the accounts the user owns, in order to make sure that the backup can be used to restore potentially lost access to all of them. Accounts can either be created from inside the wallet’s interface (clicking on the “+ Add Account” button) or imported if they already existed outside the wallet. Each account will have a unique address to which you can send your XRP. After you are finished with adding the accounts, create the backup and store it somewhere safe. XRP network by default requires each wallet to keep at least 20 XRP stored at all times, meaning that you’ll effectively have to “pay/donate” this much to have an address open on the XRP ledger. This was introduced to protect the shared global ledger from growing excessively as the result of spam or malicious usage. As such, your Toast Wallet will always need to have at least 20 XRP on it if you intend to use it. Next, you will need to “activate” any newly-created address you have by sending at least 20 XRP to it. This will both help you learn how to send XRP to an address (with only 20 XRP on the line if you screw something up) and activate the wallet for future transactions. To send XRP to your wallet, you can enter the desired address which can be found in your wallet. explains the Toast Wallet FAQ. exchange will refund your funds back to the Toast wallet. being hacked and exposing you. Some people had concerns about the backup code generation; the code is saved on your desktop computer which can potentially be a sign of trouble and low safety. Still, if someone were to gain access to this code, they would still require the passphrase and your recovery phrase and your PIN to be able to restore your wallet on a different device and steal your funds. Still, keep in mind that Toast Wallet qualifies under “hot” wallets and is a less safe solution than a cold wallet like Ledger Nano or Trezor. The wallet can be run on/from multiple devices; all you need to do is generate the backup of the wallet and then use that + either your PIN or your passphrase or your recovery phrase to restore the wallet on a different device. All you have to do is select the “existing wallet” option at the initial wallet setup screen. Toast wallet can even be run from a USB thumb drive by downloading the portable executable installation. concrete, direct development efforts in the future. You can reach the customer support via email, phone, online ticket, Discord or social media like Twitter or Reddit. The support team seems reliable as you don’t need to wait long for receiving the response. The company also has an extensive FAQ section you can read to attempt to troubleshoot any potential issues you might have with the wallet. Still, the Discord will likely be your best bet as the developers and moderators are almost always online there. worst place to stash your crypto ammunition.